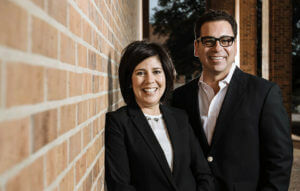 Tom and Leti Contreras have made another landmark gift to their alma mater. This time, it’s $2 million for the Risk Management program within the Greehey School of Business. Their biggest donation to date will endow the Contreras Family Executive in Residence and the Risk Management Student Success Fund. The couple has donated more than $3 million to St. Mary’s University in the past three years. In 2014, they gave $1,120,000 to build a pub and social gathering space on campus, as well as to fund a full-time assistant golf coach position and purchase a van, clothing and equipment for the golf teams. Tom (B.B.A. ’88) has been President and CEO of Texas Security General Insurance Agency, Inc., since 2003, and Leti (B.A. ’89) serves as its Executive Vice President. She also is a member of the St. Mary’s University Board of Trustees. “Leti and I are thrilled to help expand the reputable Risk Management program that Dr. David Sommer has built over the years,” Tom Contreras said. “We hope to expose students to the diverse nature of the insurance business and of risk management – not only in the classroom, but also with supplementary internships and leading industry events and conferences in the U.S. and abroad. The Contreras Family Executive in Residence will be a professional from the risk management and insurance industry with significant executive experience and a passion for helping students achieve success. The Risk Management Student Success Fund will be devoted to a variety of student activities, such as attending national professional conferences and competitions, hosting events that allow for student engagement with industry professionals, and providing financial assistance to students with out-of-town internships. The Finance and Risk Management major at St. Mary’s seeks to prepare students for careers in which they can make a difference in the lives of individuals and in the success of companies. The Finance portion of the program focuses on developing the ability to analyze financial information and recommend sound financing and investment options. The Risk Management portion helps students identify, analyze and manage risks faced by individuals and organizations. The two disciplines are complementary, and their unique combination in the Finance and Risk Management major produces powerful results that lead to successful student outcomes. Graduates have gone on to careers with industry leaders such as Marsh, JPMorgan Chase, Willis, Deloitte, Travelers, The Hartford, Zachry Group, USAA and Valero.